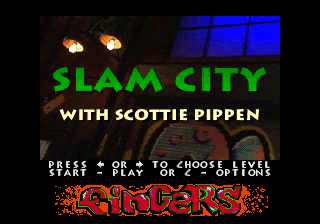 Slam City with Scottie Pippen is a full motion video game developed and published by Digital Pictures for the Sega Mega-CD and DOS computers. It was also one of the five Sega Mega-CD 32X games. Slam City is a basketball game, rendered entirely with full motion video. The player has to gain enough "respect" to play against Scottie Pippen. It was a very large game, distributed over four separate discs. Main article: Slam City with Scottie Pippen/Magazine articles.